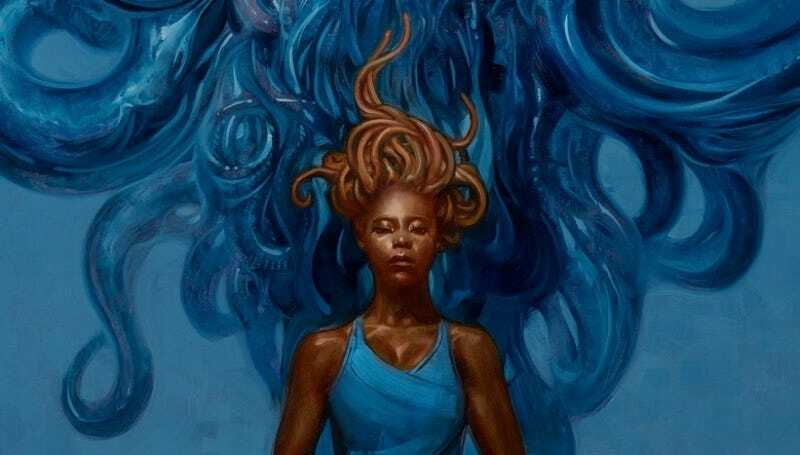 io9 is thrilled to share the exclusive first excerpt from author Nnedi Okorafor’s Binti: Home, the sequel to her coming-of-age tale Binti, which won Hugo and Nebula Awards for Best Novella this year. It picks up a year after the first story ended, and raises the stakes for its two main characters. “Five, five, five, five, five, five,” I whispered. I was already treeing, numbers whipping around me like grains of sand in a sandstorm, and now I felt a deep click as something yielded in my mind. It hurt sweetly, like a knuckle cracking or a muscle stretching. I sunk deeper and there was warmth. I could smell the earthy aroma of the otjize I’d rubbed on my skin and the blood in my veins. The room dropped away. The awed look on my mathematics professor Okpala’s face dropped away. I was clutching my edan, the points of its stellated shape digging into the palm of my hands. “Oh, my,” I whispered. Something was happening to it. I opened my cupped palms. If I had not been deep in mathematical meditation, I’d have dropped it, I’d not have known not to drop it. My first thought was of a ball of ants I’d once seen tumbling down a sand dune when I was about six years old; this was how desert ants moved downhill. I’d run to it for a closer look and squealed with disgusted glee at the undulating living mass of ant bodies. My edan was writhing and churning like that ball of desert ants now, the many triangular plates that it was made of, flipping, twisting, shifting right there between my palms. The blue current I’d called up was hunting around and between them like a worm. This was a new technique that Professor Okpala had taught me and I’d gotten quite good at it over the last two months. She even called it the “wormhole” current because of the shape and the fact that you had to use a metric of wormholes to call it up. …I was in space. Infinite blackness. Weightless. Flying, falling, ascending, travelling through a planet’s ring of brittle metallic dust. It pelted my skin, fine chips of stone. I opened my mouth a bit to breathe, the dust hitting my lips. Could I breathe? Living breath bloomed in my chest from within me and I felt my lungs expand, filling with it. I relaxed. “Who are you?” a voice asked. It spoke in the dialect of my family and it came from everywhere. “Binti Ekeopara Zuzu Dambu Kaipka of Namib, that is my name,” I said. “There’s more,” the voice said. …I was back in the classroom. Sitting before Professor Okpala. I was so angry, I thought. Why was I so angry? It was a horrible feeling, that fury. Back home, the priestesses of the Seven might even have called this level of anger unclean. Then one of my tentacle-like okuoko twitched. Outside, the second sun was setting. Its shine blended with the other sun’s, flooding the classroom with my favorite color, a vibrant combination of pink and orange that the native people of Oomza Uni called “ntu ntu”. Ntu ntu bugs were an Oomza insect whose eggs were a vibrant orange-pink that softly glowed in the dark. The sunlight shined on my edan, which floated before me in a network of current, a symmetry of parts. I’d never seen it disassemble like this and making it do so had not been my intention. I’d been trying to get the object itself to communicate with me by running current between its demarcations. Okpala claimed this often worked and I wanted to know what my edan would say. I had a moment of anxiety, frantically thinking, Can I even put it back together? Both the blue from the current I still ran around it and the bright ntu ntu shined on Okpala’s downturned face. She had an actual notebook and pencil in hand, so earth basic. And she was writing frantically, using one of the rough thick pencils she’d made from the branch of the tamarind-like tree that grew outside the mathematics building. I frowned and shook my head. “I don’t know…something happened.” I bit my lip. “Something happened.” When she looked up, she caught my eye and I had a moment where I wondered whether I was her student or piece of research. “Are you alright?” Professor Okpala asked. Now Professor Okpala laughed. I clenched my teeth, boiling. Again. Such fury. It was unlike me. And lately, it was becoming like me, it happened so often. Now it was happening when I treed? How was that even possible? I didn’t like this at all. Still, I’d been working with Professor Okpala for over one Earth year and if there was one thing I should have learned by now it was that working with any type of edan, no matter the planet it had been found on, meant working with the unpredictable. “Everything comes with a sacrifice,” Okpala liked to say. Every edan did something different for different reasons. My edan was also poisonous to Meduse; it had been what saved my life when they’d attacked on the ship. It was why Okwu never came to watch any of my sessions with Okpala. However, touching it had no such effect on me. I’d even chanced touching my okuoko with my edan. It was the one thing that let me know that a part of me may now have been Meduse, but I was still human. I gathered my backpack and was off before she could change her mind. Professor Okpala was not head professor of the mathematics department for nothing. She’d calculated everything probably the day she met me. It was only much much later that I realized the weight of that brief warning. I took the solar shuttle. With the second sun setting, the shuttle was at its most charged and thus its most powerful. The university shuttle was snake-like in shape, yet spacious enough to comfortably accommodate fifty people the size of Okwu. Its outer shell was made from the molted cuticle of some giant creature that resided in one of the many Oomza forests. I’d heard that the body of the shuttle was so durable, a crash wouldn’t even leave a scratch on it. It rested and travelled on a bed of “narrow escape”, slick green oil secreted onto a track way by several large pitcher plants growing beside the station. I’d always found those huge black plants terrifying, they looked like they’d eat you if you got too close. And they surrounded themselves with a coppery stink that smelled so close to blood that the first time I came to the station, I had what I later understood was a panic attack. I’d stood on the platform staring blankly as I held that smell in my nose. Then came the flashes of memory from that time so vivid…I could smell the freshly spilled blood. Memories from when I was in the dining room of a ship in the middle of outer space where everyone had just been viciously murdered by Meduse. I had not ridden the shuttle that day. I didn’t ride it for many weeks, opting to take swift transport, a sort of hovering bus that was actually much slower and used for shorter journeys. When I couldn’t stand the slowness and decided to try the solar shuttle again, I’d pinched my nose and breathed through my mouth until I got onboard. Once we started moving, the smell went away. A native operated the scanner and I handed her my astrolabe to scan. She narrowed her wide blue eyes and looked at me down her small nose, as if she didn’t see me take this shuttle often enough to know my schedule. She batted one of my okuoko with a finger; her hands were bigger than my head. Then she rubbed the otjize between her finger and motioned for me to enter the shuttle’s cabin. I sat where I always sat, in the section for people my size near one of the large round windows and strapped myself in. The shuttle travelled five hundred to a thousand miles per hour, depending on how charged it was. I’d be in Weapons City in fifteen minutes and I hoped it wasn’t too late, because Okwu was about to kill his teacher. The moment the house-sized elevator rumbled opened I ran out, my sandaled feet slapping the smooth off-white marble floor. The room was vast and high ceilinged with rounded walls, all cut into the thick tooth-like marble. I coughed, my lungs burning. Wan, a Meduse-like person, was feet away, engulfed in a great lavender plume of its breathing gas. It didn’t have Okwu’s hanging tentacles, but Wan still looked like a giant version of the jellyfish that lived in the lake near my home on Earth. Wan also spoke Okwu’s language of Meduse. I’d been down here plenty of times to meet Okwu, so it knew me, too. “Wan, tell me where Okwu is,” I demanded in Meduse. But Wan was already heading to the elevator. I lifted my wrapper above my ankles and sprinted down the hallway. To my left and right, students from various parts of the galaxy were working on their own final projects of protective weaponry, the assignment this quarter. Okwu’s was body armor, its close classmate Jalal’s was electrical current. Okwu and Jalal were taught together, stayed in the same dorm and worked closely together on their projects. And today, they were being tested against each other, as was the way of Oomza Weapons Education. I was fascinated by the competitive push and pull of weapons learning, but I was glad mathematics was more about harmony. Okwu being Okwu—a Meduse of rigid cold honor, focus, and tradition—loved his program. The problem was that Okwu hated his professor and Professor Dema hated Okwu. Okwu was Meduse and Professor Dema, a human woman, was Khoush. Their people had hated and killed each other for centuries. Tribal hatred lived, even in Oomza Uni. And today that hatred, after simmering for a year, was coming to a head. “Let us finish this once and for all,” Okwu growled in Meduse. “I’ve tolerated your insulting remarks all quarter. Let me end you. Your people should not plague this university,” Okwu said. My lungs were laboring from the gas Okwu was copiously pluming out as it prepared to attack its professor. If it didn’t stop doing this, the entire room would be filled with it. I could see Professor Dema’s eyes watering as she resisted coughing, as well. I knew Okwu. It was doing this on purpose, enjoying the strained look on Professor Dema’s face. I had only seconds to do something. I threw myself before Okwu, pressing myself to the floor before its okuoko which hung just below its weaponized casing. I looked up at Okwu, its tentacles were soft and heavy on the side of my face. Meduse immediately understand prostration. “Okwu, hear me,” I said in Khoush. Since arriving at the university, I’d taught Okwu to speak Khoush and Himba and it hated the sound of both. My theory is that this was partially due to the fact that for Okwu the sound of any language was inferior to Meduse. On top of this, Okwu had to produce the words through the tube between its okuoko that blew out the gas it used to breathe in air-filled atmospheres, and doing so was difficult and felt unnatural. Speaking to Okwu in Khoush was irritating to it and thus the best way to get its attention. I called up a current, treeing faster than I ever could have back home. I’d learned much from Professor Okpala in the last year. My okuoko tickled, the current touching them and then reaching for Okwu’s okuoko. Suddenly, I felt that anger again, and some part of me deep down, firmly accused, “Unclean, Binti, you are unclean!” I gnashed my teeth as I fought to stay in control. When I could not, I simply let go. My voice burst from me in a clear and loud; in Khoush, I shouted, “Stop! Stop it right now!” I felt my okuoko standing on end, writhing like the clusters of mating snakes I often saw in the desert back home. I must have looked like a crazed witch; I felt like one, too. I heard Okwu curse at her in Meduse so deep that I couldn’t understand exactly what it said. Before I could admonish Okwu’s crudeness, Professor Dema snatched up her weapon and shot at Okwu. It made a terrible boom that shook the walls and sent students fleeing. Except Okwu. The wall directly to its left now had a hole larger than Okwu’s nine-foot tall five-foot wide jellyfish-like body. Chunks and chips of marble crumbled to the floor and dust filled the air. “You didn’t miss,” Okwu said in Khoush. Its tentacles shook and its dome vibrated. Laughter. Once on the surface, I looked at Okwu, wiped marble dust and otjize from my face and said, “I need to go home. I need to go on my pilgrimage.” I felt the air close to my skin; once I got back to my dorm room and wash up, I’d re-apply my otjize. I’d take extra time to palm roll a thick layer onto my okuoko. I’m unclean because I left home, I thought. If I go home and go through pilgrimage, I will be cleansed. The Seven will forgive me and I’ll be free of this toxic anger. Of course, I didn’t say any of this to Okwu. I only shook my head and stepped into the field of soft water-filled maroon plants that grew in the field over the Inverted Tower Five. Sometimes, I came here and sat on the plants, enjoying the feeling of buoyancy that reminded me of sitting on a raft in the lake back home. “I’ll come, too.” Okwu said. Nnedi Okorafor’s Binti: Home will be out January 31, 2017. The Future Is Here! First Look At Tor.com&apos;s Brand New Novellas! The Biggest Question About "Diverse Books": Diverse To Whom?